What types of dentures are available to Lakewood area residents? As early as 700 BC the Etruscan culture crafted dentures out of human and animal teeth held in place by gold rings and small pins. Fortunately, denture technology has come a long way. Dr. Scott Stewart and his team at South Lakewood Dental help patients enjoy gorgeous, confident smiles and healthier bodies with modern denture options. A denture replaces missing teeth. It’s usually a removable prosthetic with an acrylic base and teeth made of plastic or porcelain. Wearing dentures is far preferable to not having teeth, but there are drawbacks to traditional floating dentures. They rely on gravity, natural suction, or gooey adhesives to stay in place. They tend to slip, wobble, and pop out unexpectedly when smiling, eating, or speaking, which looks anything but natural and causes sore spots on the gums. The wearer usually has limited diet options, avoiding crunch, chewy, or sticky foods. Each time you bite down on a natural tooth, the root sends a signal to your body to reinforce density of the jawbone. Conventional dentures don’t provide that stimulation, so bone gradually shrinks and facial features develop a sunken appearance. Partial dentures may be fixed or removable. They can be a good option for the patient who has some missing teeth, and is not a candidate for dental implants. A partial denture restores the appearance of your smile and keeps remaining teeth from shifting. Complete dentures replace all the teeth in one or both arches. Dr. Stewart offers three advanced options for superior fit and function.AutoCentric™ Denture by Geneva. Dr. Stewart achieves superior aesthetics with this type of denture, by carefully considering your gender, age, personality, and hair and skin coloring in the design. Anterior teeth (the ones that show when you smile) are selected and precisely placed for a natural appearance. The AutoCentric system balances posterior (back) teeth for increased bite force and a comfortable fit Most patients claim they can eat anything with the “AutoCentric”denture. Fountain of Youth Dentures. The breakthrough technology behind premier Fountain of Youth Dentures helps to restore a more youthful appearance. Lips often appear fuller with reduced facial wrinkles. In some cases, these dentures can assist with tightening the neck and strengthening the chin. Dr. Stewart applies the principles of neuromuscular dentistry, evaluating the dimensions of soft and hard tissues, muscles, and nerves, to design dentures that bring harmony to the face. The fit is extremely comfortable, appearance is incredibly natural, and patients actually enjoy eating again! Standard Premium Denture. A high-quality custom fit denture. Implant supported dentures. Just a few dental implants impart a level of stability never before possible. Many patients are good candidates for mini dental implants. Because they may be placed and “loaded” with a denture immediately, your smile isn’t compromised while the implants heal. Implants dramatically improve chewing function, yet dentures may be removed for good oral hygiene. Implants stimulate bone density to maintain natural facial contours. Are you ready to face the world with a gorgeous smile and take a bite out of life? 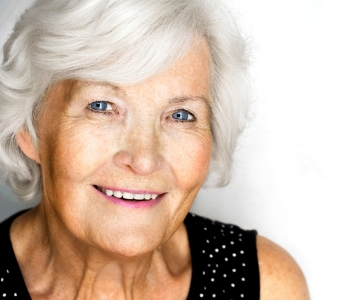 Call South Lakewood Dental at (855) 233-0023 to learn more about denture options. Home » What types of dentures are available to Lakewood area residents?